Visible marks on the skin that remain after the wound has healed are known as scars. These scars are composed of fibrous tissue. Scars can have the profound impact, however, a better understanding of the biology of scarring has led to the development of more effective scar treatment. 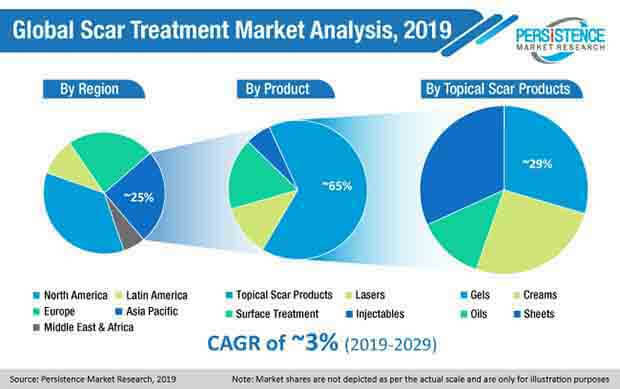 Increasing government approvals on medical products and devices, increasing awareness among people to improve physical appearance are some of the factors driving the global scar treatment market. Among various scar treatment options, laser therapy is becoming popular. It has also been noted that laser therapy helps in minimizing the histological and clinical appearance of scars. However, the high cost of laser therapy is restricting the growth of the global market for scar treatment. Raised or hypertrophic scars are also common, however, OTC silicone patches are being used on a large scale to treat these type of scars. Meanwhile, companies are increasingly investing in research activities to come up with a better formulation for scar treatment. The products such as gels, creams are also being developed to treat associated conditions with scars such as pain, redness, itching, and inflammation. Researchers are also focusing on developing new treatment options, especially for patients with large scars caused by burns and trauma. With increasing demand for laser treatment, the CO2 laser is likely to become popular in the global market for scar treatment. The report compiled by Persistence Market research on the global scar treatment market expects the market to see a moderate growth between 2017 and 2025. The global market for scar treatment is also likely to bring in US$ 13,106.0 Million revenue by 2025 end. Factors such as affordability and easy availability of scar treatment products are expected to drive the growth of the market. Atrophic scars are also known as sunken scars. These scars occur when the body starts losing skin tissues and is not able to generate it. There are various types of atrophic scars such as ice pick scar, box scar, rolling acne, and scars caused by trauma and surgery. Acne being the most common problem, increasing number of people are suffering from atrophic scars. However, new atrophic scar treatments are being introduced specifically for acne scars. It has also been found that laser treatment is more effective on atrophic scars as compared to dermabrasion. However, chemical peels are also being used widely to remove the layer of damaged skin. Increasing number of customers are shifting towards using natural and organic products to treat various skin problems. Hence, organic and natural oils and creams are gaining popularity. Owing to the minimum or no side-effects demand for natural products including gels, oils, creams have increased in the global scar treatment market. Companies developing topical scar products have also started using natural ingredients in the products to attract more customers. Scar treatment products containing essential oils such as aloe vera, and tea tree oil are witnessing growing demand from customers. Customers in developed countries are also opting for OTC products containing natural oils due to their ability to restore skin.